Ilford have released custom-crafted ICC profiles for the new Canon PIXMA PRO-1 printer. The profiles help ensure professional photographers are able to produce accurate and consistent results on Ilford Galerie media using this just-launched and feature-rich Canon printer. Avon, CT & Marly, Switzerland - October 27, 2011 – ILFORD (http://www.ilford.com), a leading developer and manufacturer of professional quality media for both inkjet printing and color photographic processes, today announced the immediate availability of its custom-crafted ICC printer profiles for the new Canon PIXMA PRO-1 professional inkjet photo printer. The profiles help ensure professional photographers are able to produce accurate and consistent results on ILFORD GALERIE media using this just-launched and feature-rich Canon printer. Developed by ILFORD print specialists, the new profiles will be used throughout the 2011 PhotoPlus Expo where ILFORD will be making prints from the new Canon PIXMA PRO-1 on its professional-grade GALERIE media at its booth (#1036). Attendees are encouraged to stop by to see first-hand how using the ILFORD ICC profiles with the PIXMA PRO-1 can maximize the expanded color gamut, denser blacks, and rich gray tones that this new printer is capable of producing. Designed for the discerning professional print-making photographer, Canon’s PIXMA PRO-1 professional inkjet photo printer features a 12 color LUCIA Pigment Ink System that provides photographers deep saturation levels for a more dynamic library of colors and hues; while the PIXMA PRO-1 has a newly designed print head that helps deliver professional print-quality at an increased speed from prior generation models. To help ensure printmakers are able to maximize the capabilities of the new PIXMA PRO-1, ILFORD has been working to craft these new profiles in advance of the hardware launch. Professional photographers can use these settings to help secure optimal images from their first round of printing to their last. Dedication to research and development ensures that the inkjet media produced by ILFORD promises not only high-quality and color-accurate prints, but also the image permanence demanded by photographers. It is this level of permanence; along with ILFORD’s unmatched history of delivering consistent quality that provides Canon with a standard of trust in ILFORD as a collaborative partner. This includes supplying ILFORD with first-looks at its new printers to ensure each new printer is optimized for its professional printing customers. Detailed instructions for using ICC profiles are available at the ILFORD website. A ReadMe file is available in the profile download section offering intuitive, step-by-step instructions. The carefully defined printer settings, created by technicians on the ILFORD Research and Development team, override standard settings to ensure optimal print results with the entire GALERIE range. GALERIE Professional Inkjet range is designed specifically to meet the demanding needs of today’s professional inkjet marketplace. 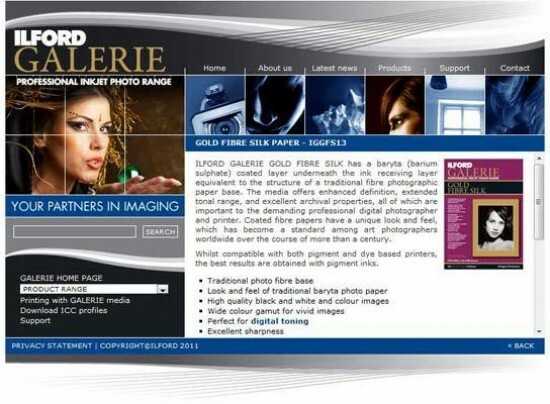 ILFORD is dedicated to developing products that deliver superior images and with GALERIE combines state-of-the-art inkjet technology with more than a century of experience in the craft of image making. To provide the right tools for a variety of applications, ILFORD GALERIE is available in three distinct versions – GOLD, SMOOTH and GRAPHIC. Canon U.S.A., Inc., is a leading provider of consumer, business-to-business and industrial digital imaging solutions. With more than $45 billion in global revenue, its parent company, Canon Inc. (NYSE:CAJ), ranks fourth overall in patent holdings in the U.S. in 2010† and is one of Fortune Magazine’s World’s Most Admired Companies in 2011. Canon U.S.A. is committed to the highest levels of customer satisfaction and loyalty, providing 100 percent U.S.-based consumer service and support for all of the products it distributes. Canon U.S.A. is dedicated to its Kyosei philosophy of social and environmental responsibility. To keep apprised of the latest news from Canon U.S.A., sign up for the Company’s RSS news feed by visiting www.usa.canon.com/rss. Founded in 1879, ILFORD is a leading player in the development and manufacture of photo quality media and other consumables for both inkjet printing and color photographic processes. The worldwide digital imaging and color photographic businesses, which include R&D and manufacturing operations in Switzerland, are owned by Paradigm Global Partners LLP. ILFORD hosts its U.S. sales operations from its offices in Avon, CT.